In the last three chapters of Micah we learn that the Jesus Christ will be born in Bethlehem, but we also learn that those who turn away from the Lord and put their trust in; guides, friends and family alone will fall! We can trust our friends and family, but we should never go against God. If we always keep on His path, we will have no reason to fear our enemies. The Messiah (Jesus Christ) shall be born in Bethlehem. He shall stand and feed his flock in the strength of the Lord. He will deliver Jacob from Assyria. The remnant is large and will be victorious over its enemies. The Lord will cut off sorceries, soothsayers and idols. “Hear ye, O mountains, the Lord’s controversy [complaint]…” (Micah 6:2). The Lord reminds the people of his favor towards them, and complains of their ingratitude. The people are imagined replying, and complaining of the Lord’s demanding nature: “Will the Lord be pleased with a thousand rams, or with ten thousand rivers of oil? …” (Micah 6:7) However, Micah explains that the Lord has revealed to them what He wants: justice, mercy and humility. The Lord compares himself to a gatherer of fruit who can find no ripe cluster of grapes. All of them have been corrupted. Family and other social relationships will crumble. “Trust ye not in a friend, put ye not confidence in a guide…” (Micah 7:5) However, enemies should not rejoice in the supposed weakness of man; “…when I fall, I shall arise; when I sit in darkness, the Lord shall be a light unto me.” (Micah 7:8) The Lord will shepherd His people with His staff. Other nations shall be brought low, and lick the dust like a serpent. God is like no one else, he will forgive his people and help them back on their feet. In chapters 3 and 4 we learn a lot about God’s mercy and WHO God really is. In LDS doctrine, we believe that God, His Son and the Holy Ghost are all individual and distinct persons. We believe that God the Father and His Son, Jesus Christ have bodies of flesh and bones. After all, we are created in their image, right!? I just love how God says he “repented” (which of course means changed his mind in this context), but God was going to destroy a city and then changed his mind because the people changed their ways. God never hates people, he loves all his children, but he gets upset and sometimes (like any good parent) has to discipline his children. Jonah gets mad about God NOT destroying the city, but they gets mad at God killing a plant. Here we see the selfishness of Jonah, he only wanted the plant because it gave him shade. God teaches him and any reader a good lesson, ALL Life is important and everyone has a purpose and meaning! The word of the Lord comes to Jonah and is again told to cry against Nineveh and its people. Jonah preaches to the people and almost immediately the people repent with ashes and sackcloth. They fasted and turned to their God. Upon seeing this, God decides not to destroy Nineveh. 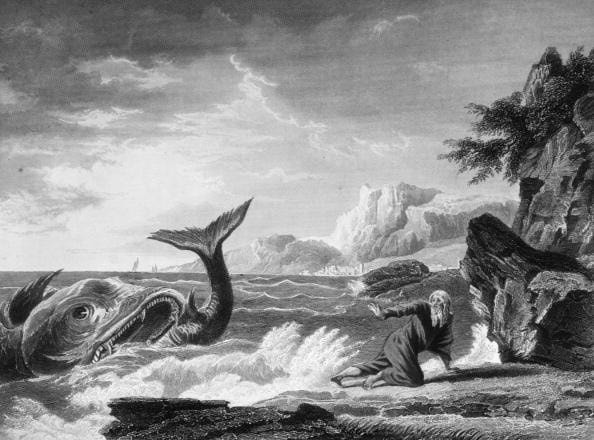 Jonah is upset because God chose not to destroy Nineveh. He leaves the city and sits in the hot sun where God causes a plant (a gourd of some sort) to grow to provide shade for Jonah. The next day God sends a worm to kill the plant. Without any shade from the hot sun, Jonah is angered and in pain and claims it would be better for him to die. God questions Jonah’s anger about the death of the plant and asks him why he thinks a plant should be spared from destruction but a large city like Nineveh should not be saved. Obadiah is one of the smallest books in the bible at about 1 ½ pages long, and includes only one chapter. Edom will be made small among the nations. Though it ascends as high as an eagle, it shall be brought down. The judgment on Edom will be complete and not like when robbers and grape gatherers leave some grapes behind. The house of Jacab shall be a fire, and the house of Joseph a flame, but the house of Esau shall be stubble. The children of Israel shall possess the land of the Canaanites. Saviors shall come to Mount Zion to judge the mountains of Esau, and the kingdom shall be the Lord’s.